Here’s where it all started: the Boy Band of Peter, Colin and Sylvester back in the TARDIS, footloose and fancy free. Like most pilots, The Sirens of Time is a clunker with flashes of brilliance offering tantalising hints of what’s to come. It’s hard to tell which direction the story is going, but a re-listen helped me unearth an A plot and B plot. The Time Lords are jerking the Doctor’s strings again, Powers Unknown are tinkering with his timeline, and each Doctor has his own single-episode adventure before joining forces in part four to fight the real villain. A simple plot device keeps pesky companions trapped in the TARDIS. I imagine Five paid for this later. Just imagine the warm welcome he received from Tegan and Turlough after they’d been cooped up together for who knows how many days. Seven begins with the weakest story, trapped on a hostile prison planet for a convicted war criminal. Bodily functions and swearing signal that this is classic Who for grown-ups. Five’s story is better, pitting him against an honourable U-Boat captain ably played by Mark Gatiss. Six breezes in as the larger-than-life, commanding and shrewd Doctor that we saw too seldom on TV, bluffing his way aboard a spacefaring conference of delegates on their way to certain doom one of the wonders of the universe. The final story unites all three Doctors in a suitably significant setting drawn from classic Who. Unfortunately, the location is used to so little effect that it might as well be a studio of generic corridors. Pete shows off his “heroic agony under torture” acting skills, while Colin and Sylvester work together surprisingly well to thwart the foe. But which foe to thwart? That’s a nice twist. The differences in their personalities prove to be key, a clever way of reestablishing their characters after a 10-15 year hiatus. An extremely sparse guest cast ranges from excellent (the aforementioned Mark Gatiss) to eardrum-bursting (Maggie Stables, of all people, playing an inhuman gurgling jailer warden). In sum: it’s worth a listen if you’re already a Big Finish fan, but I wouldn’t recommend it for first-time listeners. Big Finish has much impoved its game since 1999. Above, I was vague to avoid spoilers. Here’s a few more specific comments. As I noted above, my biggest quibble with the story besides Maggie Stables’ voice being criminally abused is the fact that Gallifrey is introduced but destroyed in the most un-epic way possible. 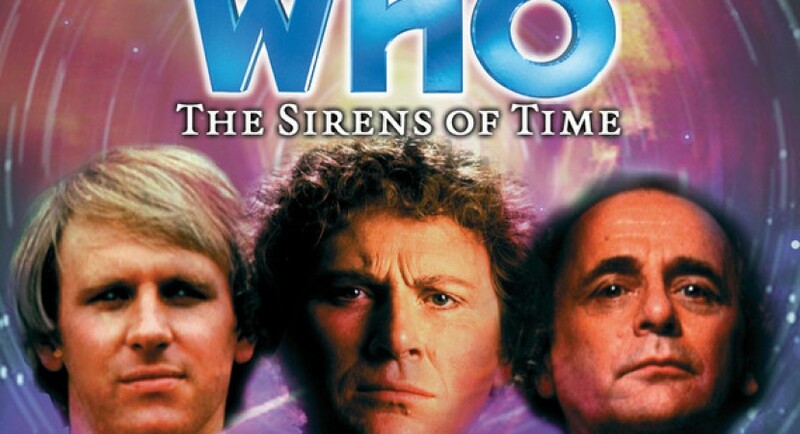 It allows Sirens of Time to have an important setting for the final episode without actually bothering to depict Time Lord society or Time Lords in any way whatsoever. I suppose this was also true of The Three Doctors, but I’m a big fan of The Five Doctors and expect more Gallifrey bang for my buck. Also, the Doctors deal with the situations as puzzles, failing to reflect on what’s happened to Gallifrey, the destroyed ships, or their lost companions. Later BFs managed to break away from the classic Who “plot before people” tendencies and give the Doctors time to emote, to react, to get personally involved, helping us to care more about the secondary characters. Also, apart from Mark Gatiss’ U-boat captain, none of the secondary characters have much personality. On the other hand, I thought it was terribly clever to introduce a surrogate companion in the all too predictable guise of a damsel in distress, reincarnate her in each of the first three stories much like the Doctor himself, and then have the “companion” turn out to be the villain. The coda summarising each Doctor without reducing them to a caricature was more subtly handled than in the new series, which is forever trying to define, label, and pigeonhole the character to the point that he’s lost a lot of breathing room. The Production Code for this audio is 7Z, implying it happens near the end of the Seventh Doctor’s life, but that doesn’t tell us where Five and Six are in their relative timelines. The Fifth Doctor mentions that Tegan and Turlough are trapped in the TARDIS, so it’s between Enlightenment and Resurrection of the Daleks. The DiscContinuity guide puts it after The Awakening, presumably to avoid Big Finish’s older!Nyssa arc which got jammed between Enlightenment and The Awakening. Six is alone, so this is after Trial of a Timelord and before Time and the Rani, but that’s still a wide range indeed. I’d guess it’s before he picks up Evelyn, and probably also pre-Frobisher. And You Will Obey Me (Main Range #211) has been incorporated into the aftermath of The Awakening, with the Doctor staying in Little Hodcombe to repair the TARDIS while Tegan and Turlough are off on a day trip with Miss Hampton. The Doctor jumps forward in time to deal with the Master, jumps back again to pick up Tegan and Turlough, and then, I’m guessing, Sirens of Time happens on their very next trip. However, some timelines pin Sirens of Time immediately after The Five Doctors for Tegan and Turlough, making Five meet both his past and future selves back to back (not to mention Sara Kingdom and Nyssa again in The Five Companions, which must have been an awful wrench! CIA Coordinator Vansell and the unnamed President of Gallifrey played by Michael Wade both return in The Apocalypse Element. The Knights of Velyshaa are defeated by the Earth Alliance in the “proper” timeline, after which they retreat to their home planet of Velyshaa to lick their wounds. Centuries later, Kalendorf leaves Velyshaa, trying to establish diplomatic ties with the Earth Alliance and negotiate an alliance with them before the Daleks invade.